Also see Grave Fleshrender, Charnel Fleshrender, Crypt Fleshrender. If both hits of the special connect, will reduce a monster's STR and END each by 5 up to 8 times. Doesn't work on Darkness element monsters or monsters in the Undead and Zombie categories. 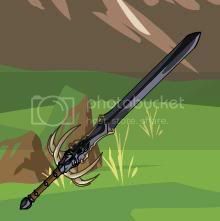 Description: This blade, forged of steel-fused bone, can actually summon a necropolis fiend's hand to swipe your enemy infecting it with grave rot, reducing its strength and endurance! Typo correction from PieLover31416. Corrections from ShiitakeWarrior.